This demo uses a noise generator to generate a random terrain, and adds a whole lot of extra functionality, but we can use this concept to also render maps of real terrain. 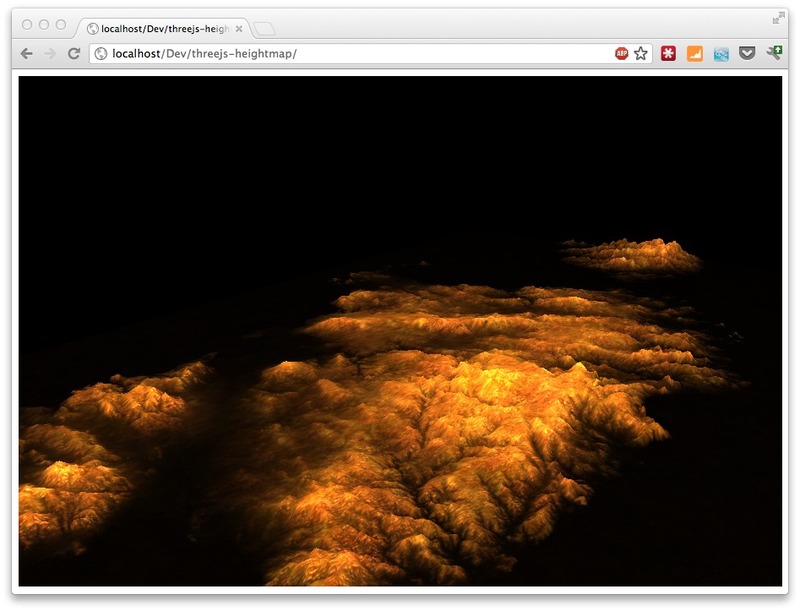 In this article I'll show you how you can use freely available open geo data containing elevation info to render a simple 3D terrain using three.js. 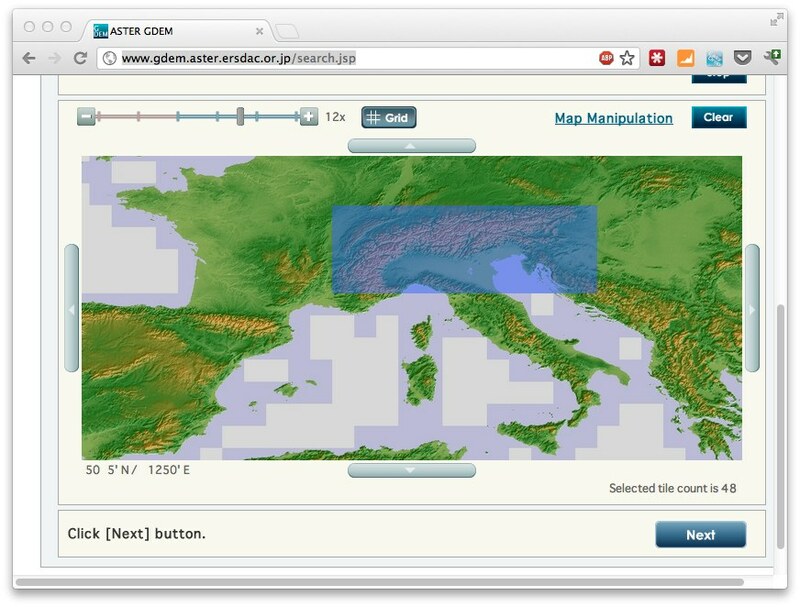 In this example we'll use elevation data that visualizes the data for the island of Corsica. "The ASTER Global Digital Elevation Model (ASTER GDEM) is a joint product developed and made available to the public by the Ministry of Economy, Trade, and Industry (METI) of Japan and the United States National Aeronautics and Space Administration (NASA). It is generated from data collected from the Advanced Spaceborne Thermal Emission and Reflection Radiometer (ASTER), a spaceborne earth observing optical instrument." So download some tiles and make sure the form you download is a rectangle (see previous screenshot). Unzip the tiles and copy all the "*_dem.tif" files into a single directory. This isn't really necessary but will make processing easier. With GDAL now you can convert these downloaded tiles to PNGs. For this I use the following very basic bash script. This will convert all the "dem.tif" tiles to a set of PNGs. Each tile is 400x400 pixels and we also define the range of the input to -20 until 2200. In other words the elevation from the input is from -20 tot 2200 meters Since the gray scale in a PNG can only be in a range of 256, this will be downsampled. (We can use other input formats, or use an RGB scale, but that would require some custom code, which is a bit out of scope for this article). 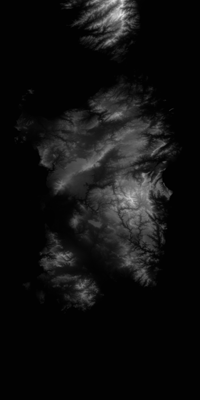 For most maps though, this should be enough for a general impression of the landscape. process="ASTGTM2_N41E008_dem.tif.png ASTGTM2_N41E009_dem.tif.png  ASTGTM2_N40E008_dem.tif.png ASTGTM2_N40E009_dem.tif.png  ASTGTM2_N39E008_dem.tif.png ASTGTM2_N39E009_dem.tif.png ASTGTM2_N38E008_dem.tif.png ASTGTM2_N38E009_dem.tif.png"
That's it for the preparation part. 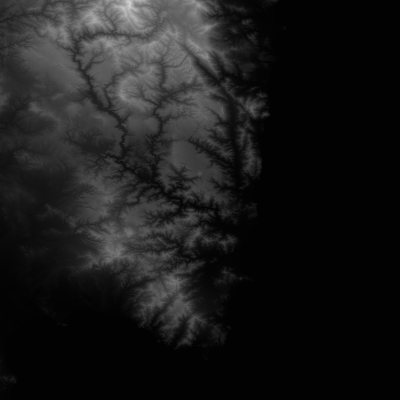 We've know got a heightmap in grayscale that we can use in Three.js (and in many other programs for that matter).